Villa Jet is a two-level vacation residence that represents out-of-the-box architecture and chic interior design. Sunny spaces are furnished with in-vogue pieces along with top-of-the-line accommodations for your utmost satisfaction. One of the first villas put up by the Samujana Estate, Villa Jet hands to you a haven of water and wind with truly upscale feels. Three of the villa’s four bedrooms are on the second level. One other bedroom is on the ground level. All bedrooms are joined to exclusive, elegant bathrooms. These also open out to scenic, private gardens. 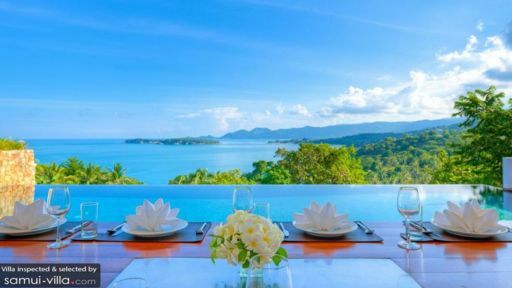 Bordering the villa’s second-level exterior is the inviting, 15-meter infinity pool that seemingly acts as an aquatic balcony where you can fix yourself along its scenic edge and gaze out – captivated – to the bay and to the mountain range. Pool beds are on the wooden deck at one end of the pool where you can lie and get some sun. At the other end of the pool is a huge boulder – a design element that gives the exterior a natural feel. Parallel to the pool area’s wooden deck is the breezy common area with an indoor pond running down the center. At one end is the living area where you can enjoy one another’s company. Across the water feature is the dining area which fluidly integrates with the pool area’s wooden deck – for indoor dining that progresses into alfresco partying. Conveniently positioned alongside the dinner table is the modern kitchen. Across each other along the indoor pond is a TV room and a study. At the end of that hall is the villa’s wine cellar. On the villa’s ground level is a private gym and on the roof is a wooden view deck and another pond which, aesthetically aside, aids in the cooling of the villa. Orchestrated by a manager, the villa’s common services – airport transfers, daily breakfast, maintenance and security – are carried out by the courteous staff which will also delight you via more services like tours, babysitting, private catering, laundry and wellness. You will be charged extra for these, however. Get to enjoy non-stop swimming, snorkeling and aqua sports at Choeng Mon Beach. But once the water level recedes, stroll to nearby Koh Fan Noir and explore the island. The Walking Street’s Night Market is open every Wednesday displaying an array of finds for sale at a discount.